Poet and writer Brian James Lewis has recently completed a very favourable review of ‘Parlour Tricks’, which you can read for yourselves over at both the Hellnotes and Horror Review websites. I’ve added the full article to the Reviews tab here at Holeinthepage, as well as a few choice excerpts below, for those who want to see what Brian had to say about my debut collection. You can catch up with Brian on Twitter @skullsnflames76 or on his WordPress blog damagedskullwriterandreviewer.com. Now it’s time for me to answer the big question. Would I purchase a copy of Parlour Tricks for myself or a friend? Indeed I would! Every book I’ve read from Parallel Universe Publications is better than the previous one. I’m not just saying that to be nice, either. There is definitely a positive evolution taking place as they grow their catalog of available works. As a reviewer, that is something enjoyable to watch. 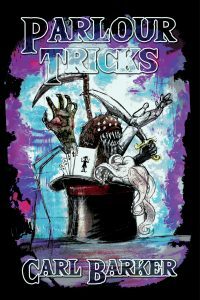 I totally encourage you to purchase a copy of Carl Barker’s Parlour Tricks in your favorite format today! Please keep in mind that this book is intended for adults and contains material best suited for them. As always, thanks for reading and remember: If you find yourself chained to a breakfast bar with no clothes on, it’s probably the work of a nutty ex-girlfriend. Good Luck!